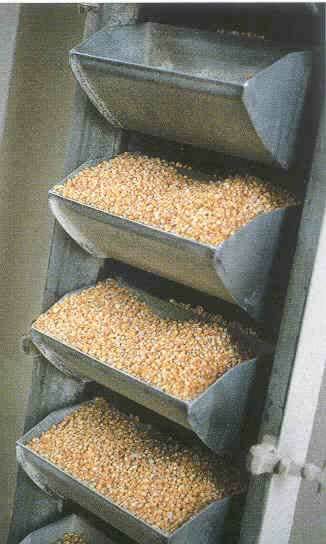 Bucket conveyors consist of a bucket elevator and an endless belt or chain with a series of attached buckets. The buckets are filled, lifted vertically to a head pulley or sprocket, and dumped. The buckets are then returned to a tail pulley or sprocket at the bottom. Bucket elevators are not self-feeding. To avoid overfilling the buckets and damaging the machinery, bucket elevators should be fed at a controlled rate. Typically, bucket elevators are placed where the chain or belt path is vertical or steeply-inclined in a single plane. Special, chain- supported bucket systems that can travel in two and three planes are also available. There are four broad categories of bucket elevators: centrifugal, continuous, positive, and internal discharge. The most commonly used types are centrifugal elevators and continuous discharge elevators. Positive discharge elevators and internal discharge elevators are used for special applications.